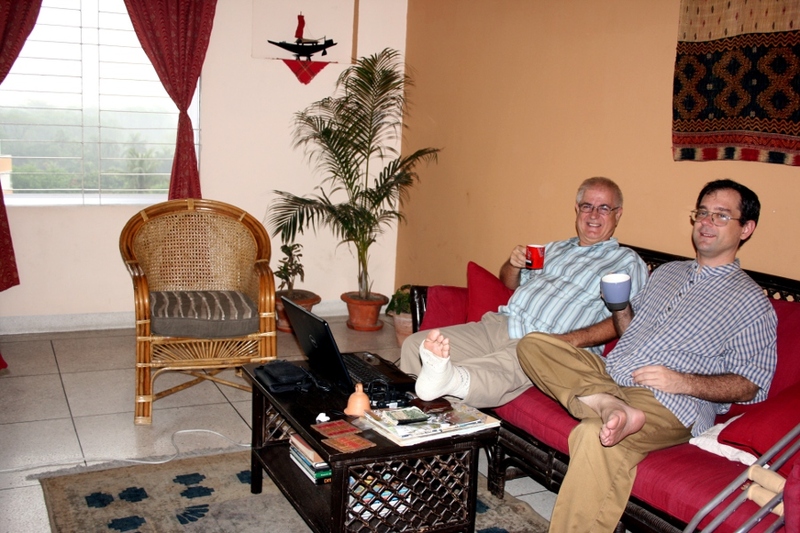 MY SON, DUSTIN AND I CHILLIN’ ON THE COUCH in our Living Room in Dhaka, Bangladesh. 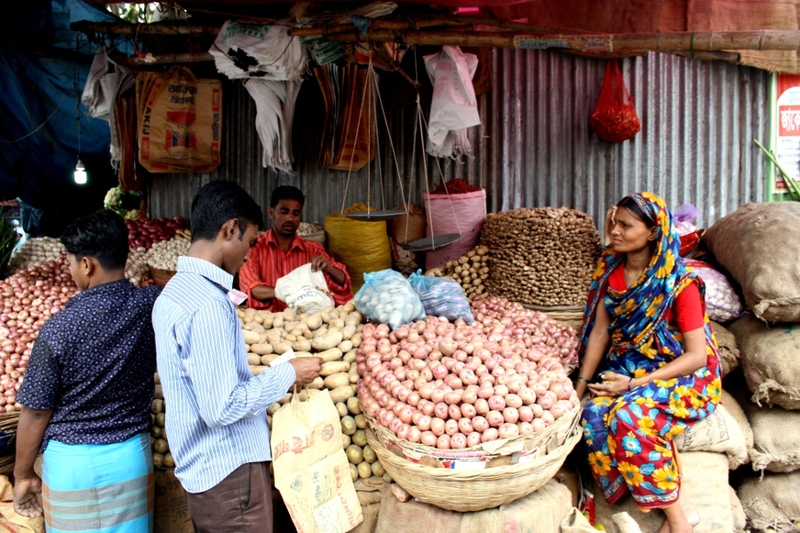 VENDOR AT THE TOWN HALL MARKET, in Mohammadpur, Dhaka. Here is where I buy my potatoes, onions, garlic, and cloves. 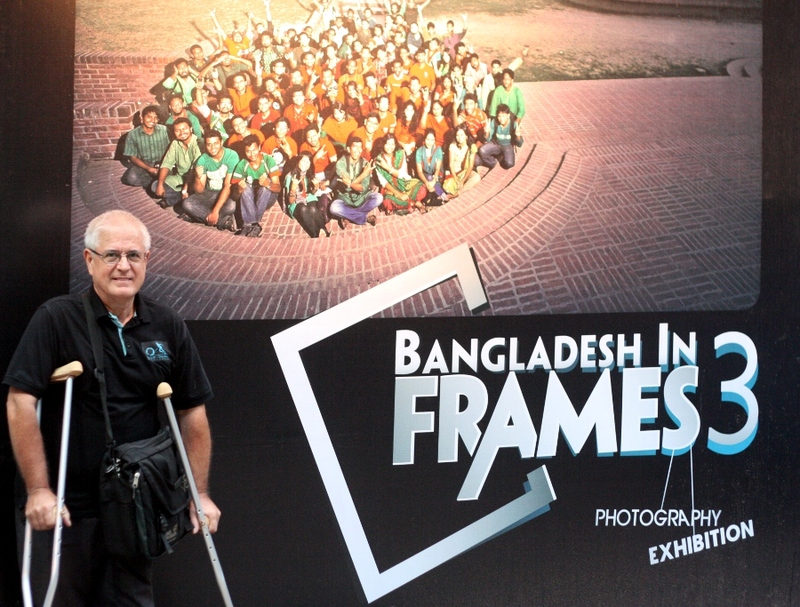 TTL’s “BANGLADESH IN FRAMES 3” PHOTO EXHIBITION is finished. It ran from March 25-29. 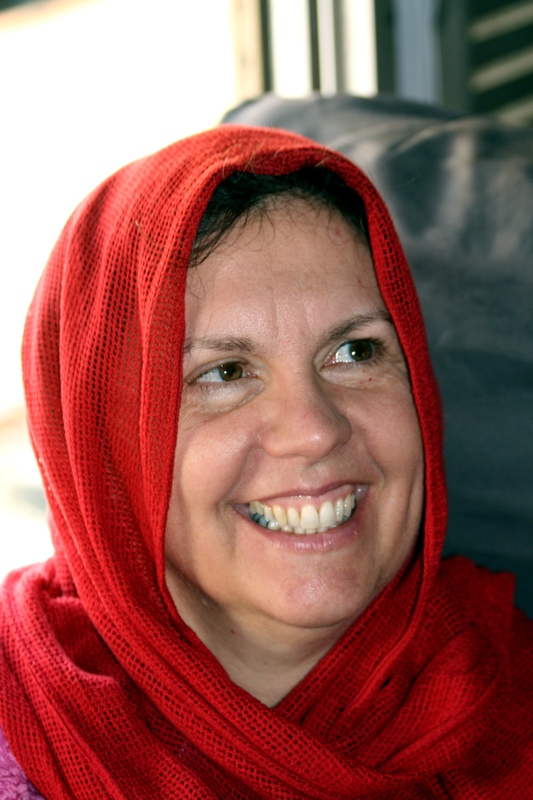 The photo below was taken outside the gallery. I am also in the group photo on the right hand side. Look for a pale face and white hair. It may be hard to do with the spot light that was aimed at the poster plus camera flash. Day 76 has a better rendition of the group photo. LITTLE BENGALI GIRL USING A MOBILE! She is as at the Mymensingh Train station, and is listening to songs on the mobile! Today I went for a followup visit to the hospital, and the OP orthopedic Dr. looked at my previous x-ray and said my ankle is not broken! After 4-6 days I will go in to have the cast taken off and re-examined! AT THE DRIK GALLERY LEAVING with a rickhsaw. 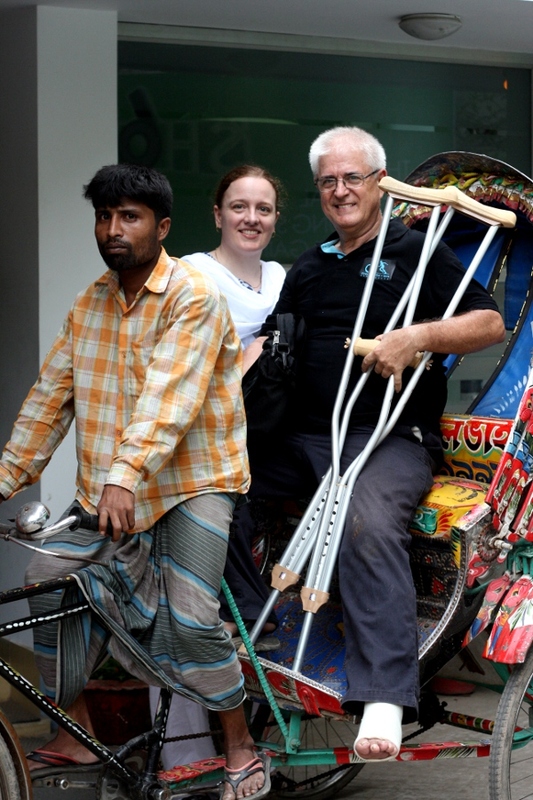 Ingrid, my friend and physiotherapist making sure I use proper procedure in getting on and off of a rickshaw. 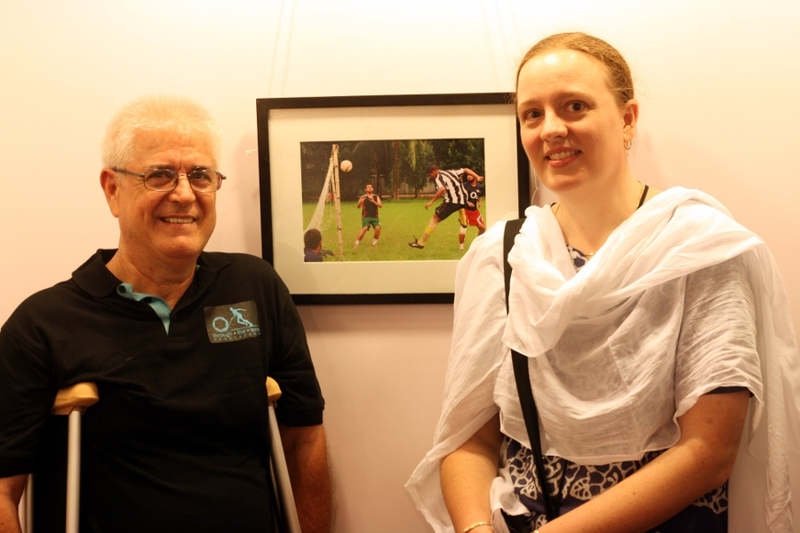 INGRID MILLER AND I STANDING with the photo of mine that accepted to be a part of the TTL “Bangladesh in Frames III” exhibit at Drik Gallery, in Dhanmondi, Dhaka, Bangladesh from March 25-29. Ingrid is a friend and physio therapist who met me at the gallery to show me how to properly get up on a rickshaw and down. She was expecting me to arrive on a CNG, so was surprised to see me on a rickshaw before she taught me how. I did confess that I had already gotten up on a rickshaw, went to the vegetable market to buy veggies, and came home and got off the rickshaw. We tried several methods but she admitted that the way I was doing was probably the best way. I suspect in physiotherapy schools they don’t teach techniques on how to get up on a rickshaw unless the school would be CRP in Savar, Bangladesh!! Actually it was my wife’s good idea on how to get into a microbus (van), which she gave me yesterday on our trip to the India border. Ingrid also helped assist and give me ideas as I negotiated the steps to the different galleries at Drik. Notice the shirt which I received as a gift because one of my photos was accepted! WE TOOK A TRIP TO THE INDIA BORDER at Akhaura/Agortala because we have a 90 day multiple-entry visa for Bangladesh. We were short on time so we left at 5:40 am and were home by 6:30 pm. I’m sure it took some longer since there was a long walk between the different check posts, and I was on crutches. 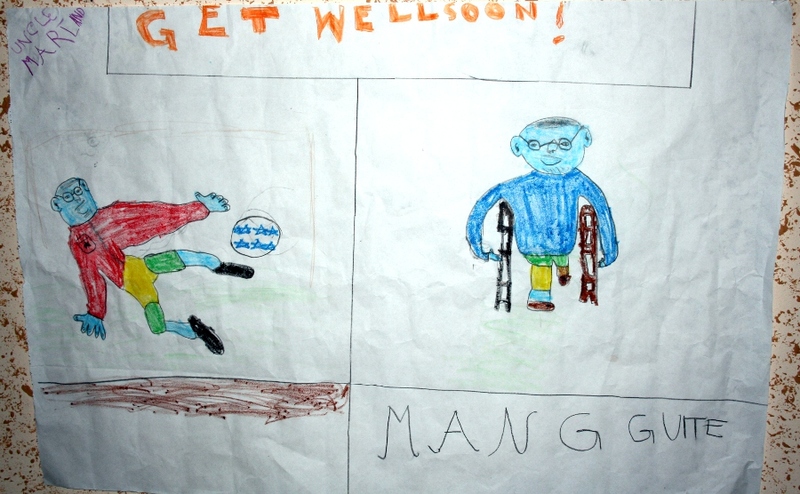 MANG GUITE’S ARTISTIC DESCRIPTION OF MY ACCIDENT and how I look now with crutches. HI EVERYONE! I GUESS GOD THOUGHT I NEEDED A BREAK! LOL No pun intended! 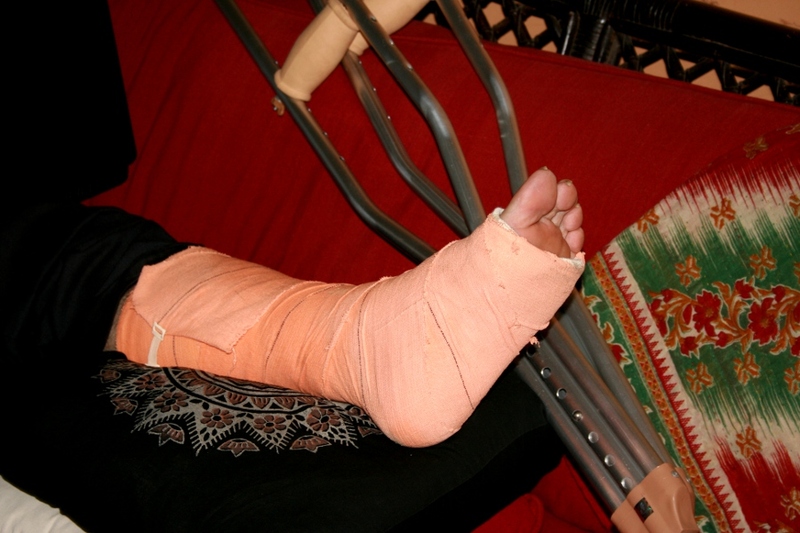 I actually broke my ankle in two places while playing football. But I did keep the fellow from scoring. 🙂 I came home and had some pain walking but kind of tried to ignore it. I talked to Austin in Ohio, because I saw on facebook that Pruitt had broken the forearm bones just behind his wrist. I went to the market with a rickshaw but never got off. Later I went to a grocery store and did some walking and up some steps. Back up the street 50 yards to get a rickshaw. I then in the afternoon went with Alice to our friends apartment to help Charles Fox put four windows back in place, as well as put 4 glass sliding doors back in place. I had to go up 4 flights of stairs to get to the apartment, while carrying a cordless drill in it’s case with another battery pac! Charles on the way home said he thinks he will take me to the ER to get my foot checked out. Here I find out my ankle was broken. 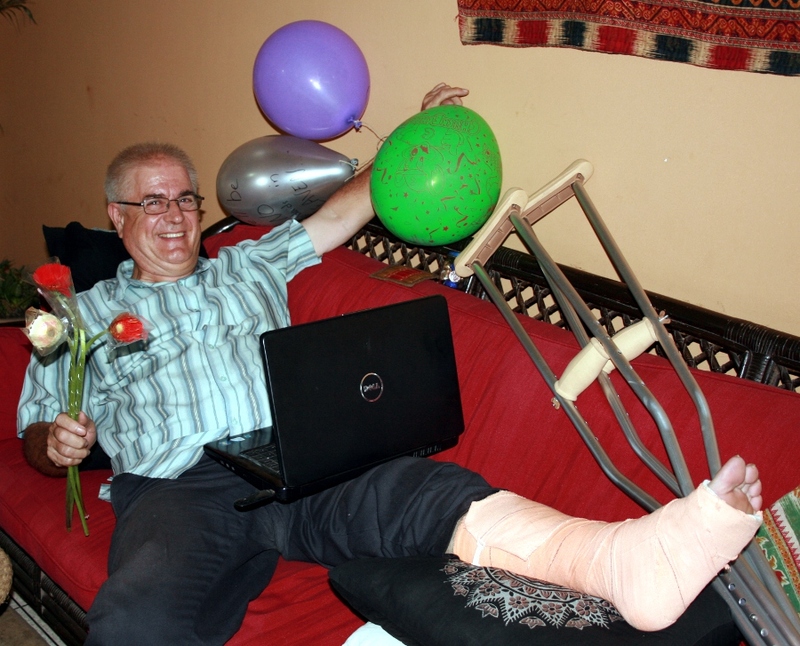 Within 1.5 hours I was out of the hospital with my leg in a cast, crutches, and on the way home in a CNG. So six weeks with crutches and no football! :-( Here I am on the couch with my feet elevated. Charles and family brought me my meds, candy, balloons, flowers and some good cheer! 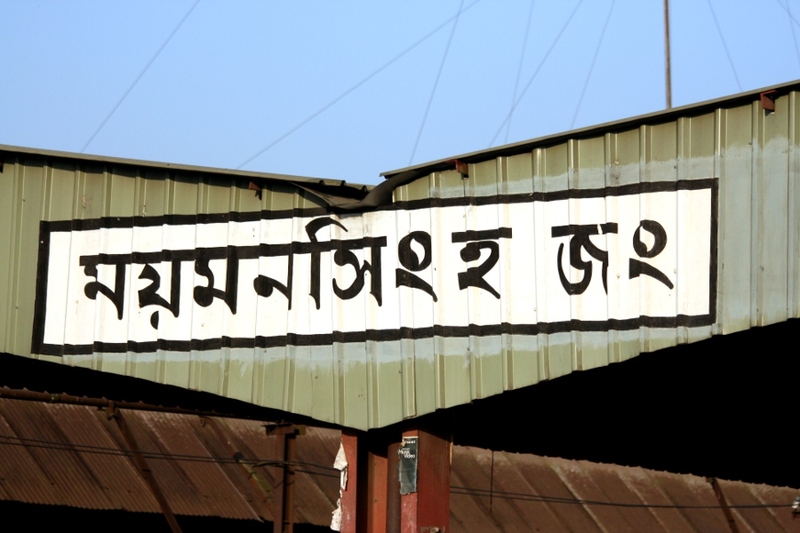 MYMENSINGH TRAIN STATION sign in Mymensingh, Bangladesh. I had to put some Bangla script on my site today, since today I’m doing a Bangla dictation assessment. Passing grade is 70%. They will read approximately 100 words to me in Bangla and I need to write the words of the story down. Points are taken off for spelling errors and for listening errors! I’ll do my best and hopefully that will be good enough. 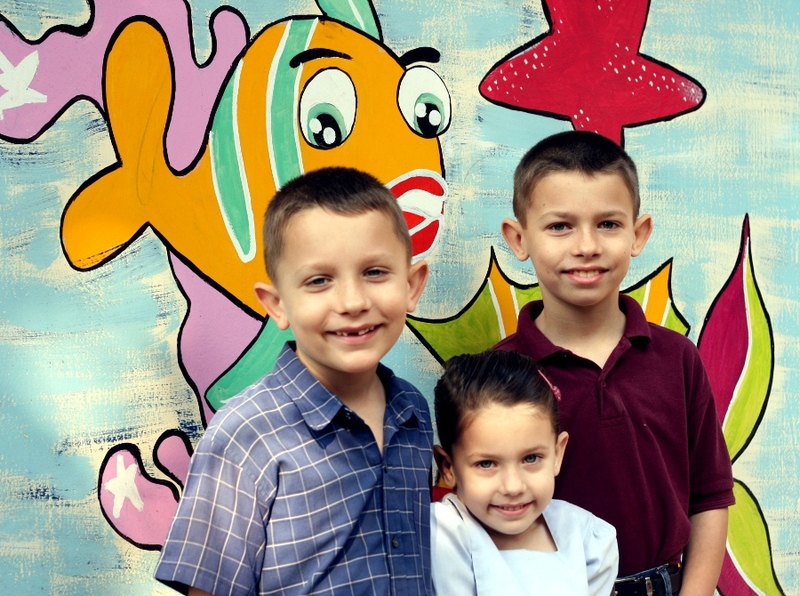 NIC, KIRSTI, AND SETH posing in front of some art which was painted on a wall in front of a wall in Iqbal Rd, Mohammadpur, Dhaka, Bangladesh.